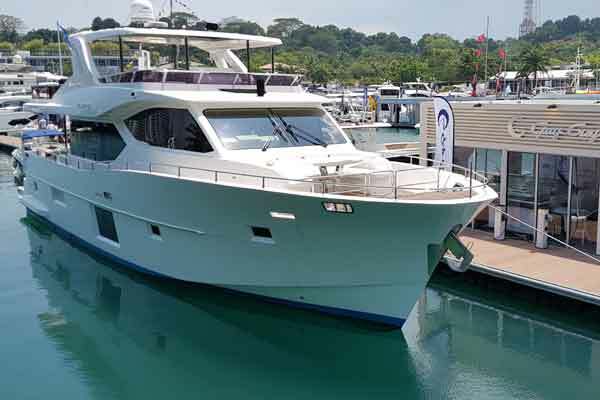 UAE-based Gulf Craft, a manufacturer of luxury yachts and fibreglass boats, showcased its latest offerings at the recently concluded Singapore Yacht Show, South East Asia's most prominent boat show. The four-day event concluded yesterday (April 15) and was held at One°15 Marina, Sentosa Cove, Singapore. CEO Erwin Bamps said: "The increasing global wealth shift to Asia and the region's growing number of ultra-high net worth individuals has offered the yacht industry a wave of opportunities in the Asian region." “With Singapore currently having the highest concentration of millionaire households in the region, along with Japan and China, Asia provides a rich ground for our leisure fleet,” he said. Redefining the standards for the yachts in its class, Nomad 65's long-range ability to discover South East Asia's beautiful and untouched cruising grounds is bolstered by its capability to handle adverse weather conditions. Thanks to its semi-displacement (hybrid) hull design, a type that combines the best of planning and displacement hull configurations to enhance reliability, seaworthiness and stability, said a statement from the company. Additionally to its sophisticated hull design, Nomad 65 focuses on luxury and comfort as well. The interior is tastefully finished in olive wood veneer radiating light and truly contemporary style. As the Emirates’ leading yacht and boat manufacturer with over three and a half decades of experience, Gulf Craft boasts a worldwide presence offering a complete range of craft from 27 ft right up to 175 ft, it said.